The Great Room - The main meeting space at Easton Mountain. Located on the upper level of the Lodge, it is a spacious, sunny, 60' x 40' room with a wood-burning fireplace, hardwood floors, and large windows on three walls. This space is ideal for large group gatherings and may be set up in a variety of ways, depending upon the needs of your group. The Dining Room - Meals are generally served buffet-style in our Dining Room, located on the upper level of the Lodge. Our Dining Room can seat up to 24 people, with additional seating available in the Sunroom (24 people); and additional seating can be provided in the Great Room (up to 100 additional people). 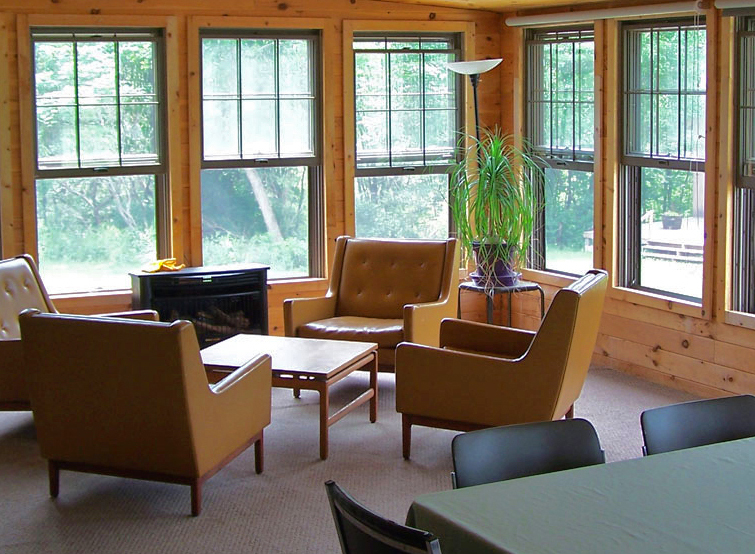 The Sunroom - A room on the upper level of the Lodge with a beautiful view of the pond and which may be used for additional dining and meeting space. It has a gas-powered fire and comfortable seating. It is a lovely place to relax, talk to new friends, watch a movie, or hold an intimate meeting of up to 32 people. The Spa Area - Includes a hot tub with a beautiful view of the pond and mountains, massage room, and two bathrooms with showers, On the ground level of the Lodge. 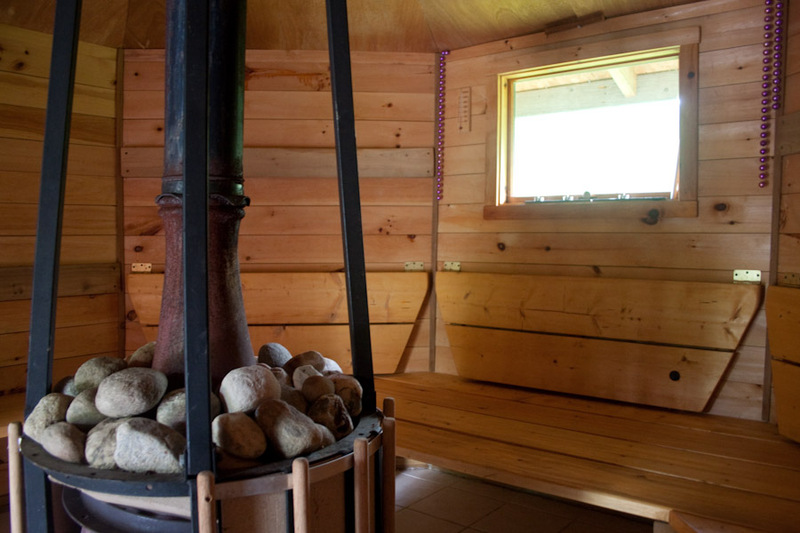 The Sauna - Our octagonal, wood-burning, freestanding Sauna in the woods is available year-round. It can accommodate up to 20 people. 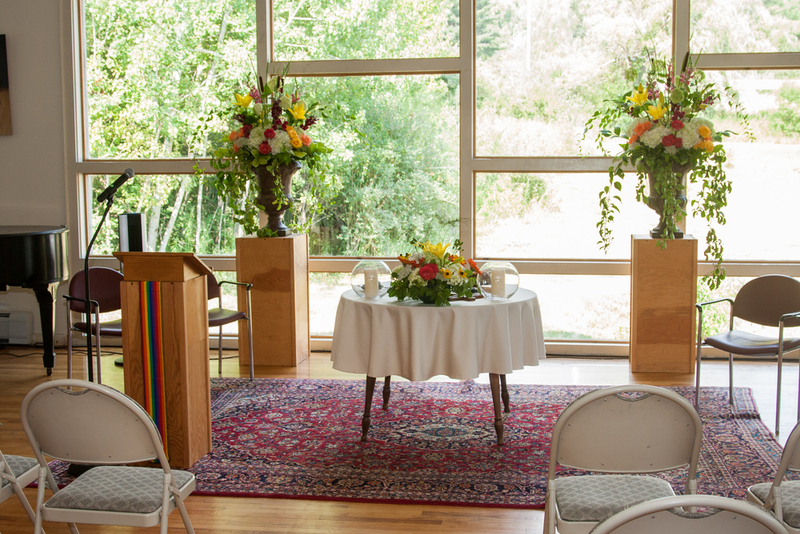 The Temple - An interfaith sanctuary located adjacent to the pond with lovely views of the water and mountains. Conveniently located near the Lodge, it is perfect for rituals, workshops, meditation, or meeting space. It can be set up in a variety of formats to suit your group's needs. The Outdoor Pool - Our freestanding above-ground Pool is available in the warmer months. Complete with deck, it offers views of the woods. The Garden Cabin - A dormitory-style accommodation with five bunk beds, our Garden Cabin offers wifi access and shared toilet facilities. Shower facilities are located on the ground level of the Lodge, approximately 500 feet away. Guests are also welcome to bring their own tent and camp in a variety of beautiful locations on the land. From a platform right on the duck pond to our hillside next to the Guest House, this option allows you to enjoy the beautiful land while still offering you the comforts of facilities available at the Lodge.